The Arizona Department of Emergency and Military Affairs (DEMA) and the Arizona Commission for the Deaf and the Hard of Hearing (ACDHH) have partnered to ensure the Whole Community is better prepared for an emergency or disaster. Whole Community preparedness means that all individuals, governments and businesses understand, engage and invest in what the entire community needs to be prepared. 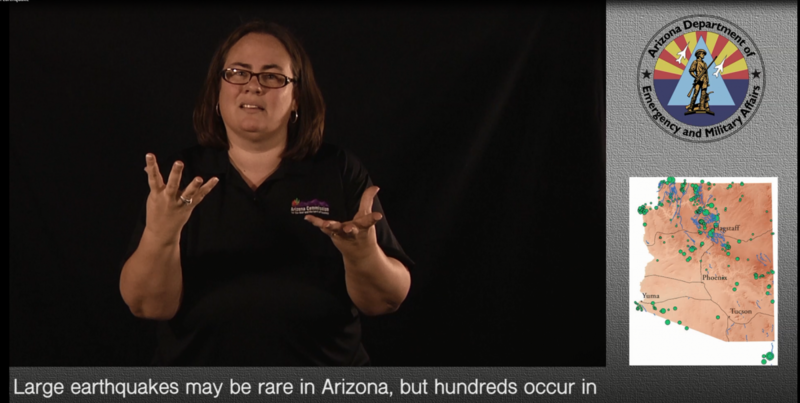 DEMA and ACDHH, with support from the Arizona Department of Public Safety (DPS) developed a series of videos on the topic of emergency preparedness for the Deaf and hard of hearing communities. Each of the videos is delivered in American Sign Language and captioned. Write and rehearse family communication and preparedness plans that identify a family meeting place, account for special needs, and include local emergency numbers and an “out-of-town” contact. Gather enough to sustain you and your family for at least three days. Suggested kit items include first aid supplies, non-perishable food, drinking water (one gallon/per person/per day), a flashlight, batteries and a radio. Know what the threats are to your community, and how your employer and your child’s school or daycare plans for an emergency. Find out what hazards can affect your community. Know what TV and radio stations to watch or listen to and what websites, like www.AzEIN.gov, to monitor in an emergency. Be a positive preparedness example for family, friends, neighbors and coworkers. Give blood or take a basic first aid course and invite others to join you. Share what you’ve learned about personal and family preparedness and find ways to involve others in the preparations.